We had an unexpected but delightful adventure last week. Friends Rose and George called to invite us along as they had a cabin at Sisters Beach become available. We drove our truck for more leg room in the back and left Friday morning. Our group decision - take the road through the great lakes area. We stopped at the Pencil Pine World Heritage area, and took the board walk out to Pine lagoon all very beautiful. The drive up took us about 7 hours by the time we'd meandered through a few sea side towns and stopped for coffee along the way. It as our night to cook dinner and after a full day of driving, Graham produced a wonderful seafood chowder! Saturday morning dawned muggy and foggy. We had a hearty pancake breakfast and Sanders Adventures tours guided by Graham took us on a brilliant day. We started with a hike down to and along Sisters beach, up to the wet caves (interesting moss on the cave walls that glowed luminously green when you looked at it from the cave entrance) then over the top of the point to anniversary bay (very apt as it was George & Rose's anniversary). The different rock formations up North are amazing! When we got back we hopped into the truck and went to Boat Harbour - it was like a 1950's beach town with a white sandy beach in a bay of beautiful turquoise waters. After a splash in the ocean and an ice cream, we drove to Stanley and saw "the Nut" (we didn't attempt the climb as it was late by this time and we know we'll be this way again.) We ended the day with vegetarian curry followed by pictionary and charades. 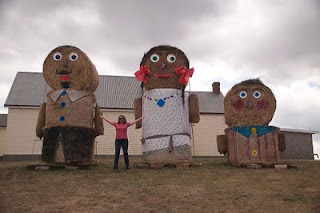 Sunday we took the inland route home, another big day of driving for Graham and he even stopped for me to have a photo taken with the Hay people along the way!! We ended our adventure at Rose & Georges for champagne and dinner on their deck and then home to relax!